We’re going to sign off for a few days. The Newport boat show – the first show of the season – starts tomorrow, and we’ll be busy meeting and greeting! We were told that there are 50% fewer boats here than 4 years ago. Wow. 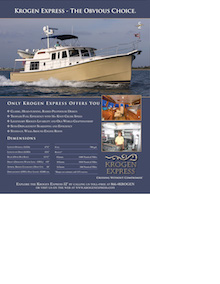 We are grateful that Krogen Express Yachts LLC is in excellent shape, selling boats and building more. And we are grateful for our wonderful family of owners. While we’re tooting our own horn, let me just add here – on a personal note – that I continue to be awed by the work ethic and attention to detail of my two “boys”, John and Bob. John is hard at work on the boat here in Newport while Bob has been tending to things in Florida, getting a boat ready for it’s new owners. We’ll reunite this evening, get a good nights sleep and be all set to go in the morning. The boat is (nearly) ready, the weather forecast is good, and we’re fired up! This is our show boat on a mooring in Newport, taken a couple of weeks ago. We had a wonderful time in Nantucket, the second home of relatives and dear friends. From Newport it’s a nice easy jaunt of 4-1/2 hours at fast cruise (15 kts), or at a slower speed of 9.5 kts in 7+ hours. Originally a booming whaling port, Nantucket has been named a National Historic District and has architecturally changed little since the 17th century, as seaside cottages and old-fashioned lamps still line its streets, many of which are “paved” in cobblestones. Some refer to it as “adult Disneyworld”! Chic shops, unique architecture, gorgeous gardens, beautiful people. All in all a very magical spot. If you’re ever cruising in the northeast, for sure add this to your “absolutely must see” list. One morning we left our mooring and headed to the dinghy dock for our morning walk. This particular dinghy dock runs parallel to the beach and is attached by a ramp to a very long dock which runs perpendicular to the beach. As we were pulling up to the dock, our dog M.E. spotted some ducks swimming away from the shore. She jumped off the dinghy, up the ramp, down the long dock, onto the beach, and started swimming after the ducks. She got farther and farther from the shore – a total swim of about 150 feet! 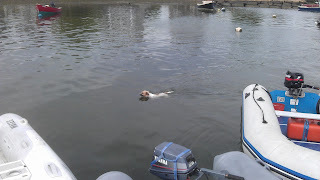 (But fortunately, because of the configuration of the docks, she was actually swimming back toward where we were.) It was hilarious and nerve-wracking at the same time. She saw those ducks and took off, into the water. She kept swimming and swimming, her short legs paddling away, and her little head bobbing over the water. I was getting nervous that she would wear out. But she finally swam back to us at the dock and John pulled her out of the water. Silly dog. This is the mooring field in Nantucket harbor with the church steeple in the background. And Brandt Point lighthouse on our left as we departed the harbor to return to Newport. Speaking of provisioning……..do you ever consider how long a bar of soap or a roll of paper towel lasts? Two weeks? Four weeks? Have you ever wondered how many cups you can get out of a bag or tin of coffee? And what about water consumption. Have you ever thought about what would happen if you only had 370 gallons of water and had to use it wisely until you could obtain more? Over the years of boating and provisioning, I’ve become more aware of how many rolls of toilet paper and how many bottles of blue cheese dressing (John and Bob’s favorite) to stock for a 2-1/2 mth boat trip (and how much water I’m using when I wash dishes or take a shower). Although I will readily admit that I don’t have a 100% record! No way! We haven’t even cracked open the numerous packages of popcorn I brought along, but I did have to purchase more soap today! Newport is another very special spot. Tons of charm. Tons of history. Tons of absolutely gorgeous sailboats. And also tons of tourists! Nonetheless, we always enjoy stopping here. Our friends – and Krogen Express owners – let us borrow their mooring. After we were settled, we went to their house for a catch-up visit and take-out Thai dinner. We have such a great group of owners! It’s like a family. We cherish and appreciate each and everyone of them. Many of them have been to our home, and in turn, we have been to their homes for dinners and overnights. This particular couple have just shipped their boat across the Atlantic to England where they will begin their several year trek through Europe to the Med. Very exciting! This was the view from our mooring, which included the “Nantucket Lightship”. Here’s a bit of history about it: The NANTUCKET LIGHTSHIP, the last lightship in service in the US until 1985, is one of the most unique luxury classic charter yachts on the water today. The mission of the Lightship, as lifesaving mission, was to stand resolute regardless of the peril and guide all to safe haven. The WLV-612 is one of a proud line of Nantucket Lightships which were known as the Guardian Angels of the North Atlantic from 1854 to 1983; it was the Nantucket Lightship and not the Statue of Liberty which first greeted mariners and immigrants to America. Built in 1950 at Curtis Bay, Maryland by the United States Coast Guard Yard for $500,000, Lightship 612 was the last ship to serve a full tour of duty on the Nantucket Shoals station and was also the last US lightship in commission. In 1975 Lightship Ambrose, the Nantucket’s sister ship, was renamed Lightship Nantucket II and the two ships spelled one another, relieving each other approximately every 21 days. At 2:30 a.m. on December 20, 1983 the 613 relieved 612 until 8:00 a.m. then was relieved by a Large Navigational Buoy, therefore 613 was last Lightship on station in US and on Nantucket Station. In December 1983 the Lightship 613 was sold to the New England Historic Seaport to become a museum ship in Boston and Lightship 612 was reassigned to cutter duty. Finally, after being decommissioned on March 29, 1985 and ending the 165 year era of United States Lightship service, Lightship 612 was sold to the Boston Educational Marine Exchange and shortly thereafter was taken over by the Commonwealth of Massachusetts. In March 2000, she was purchased by William and Kristen Golden, restored as the only fully operational Lightship in the United States and converted to a luxury yacht which was berthed at Rowes Wharf in Boston. In the summer of 2007 she was available for charter in Nantucket harbor and Newport. The Nantucket Lightship WLV612 was chartered for one year by the 5 star Delamar Hotel in Greenwich Connecticut in 2008, served as the mothership for the New York Yacht Club summer cruise and was chartered from November 2008 through May 31, 2009 at The North Cove Marina at the World Financial Center in Manhattan, New York. 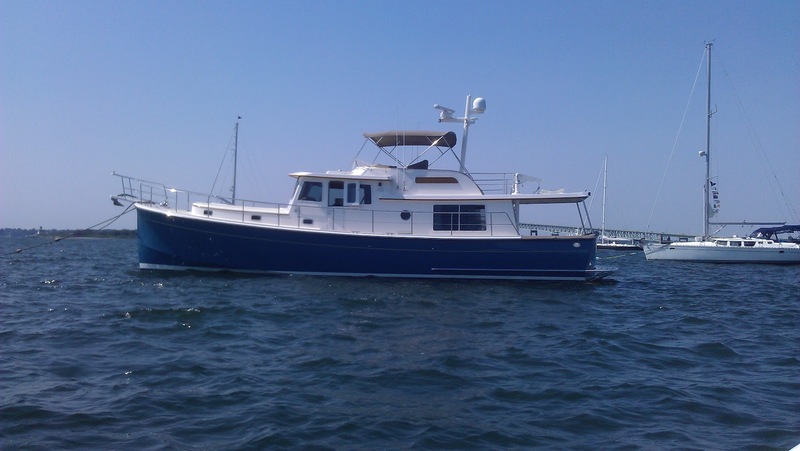 During the summers of 2009 and 2010, the WLV612 was docked in Martha’s Vineyard on Charter in Martha’s Vineyard, Nantucket, Newport and Long Island Sound, returning in the fall of 2010 for charters Newport. 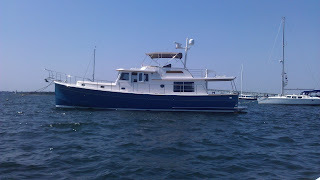 Our 3 day stay in Newport included a treasured visit from my sister who lives in Boston, and lunch with our friends from Essex (mentioned in the previous posting) who had captained a 60+ foot motoryacht up for a two day visit to Newport. We also took lots of walks, did some shopping, and made the all-important trek to the local Stop and Shop! It was our intention to leave Newport on Monday, Labor Day, and make the short trip to Martha’s Vineyard and then proceed to Nantucket on Tuesday. But the forecast for Tuesday was for high winds and big seas, so we decided to go all the way to Nantucket on Monday. We have found that it works to our advantage to respect large, open bodies of water such as Buzzards Bay, Vineyard Sound and Nantucket Sound!! On the way, we passed the Elizabeth Islands (picture above). Located at the outer edge of Buzzards Bay and north of Martha’s Vineyard, the Elizabeth Islands are privately owned by the (Steve) Forbes family. The east wind made for a messy ride; but we reached our destination – Nantucket Harbor – mid-afternoon. Here are some pictures of the approach into Nantucket Harbor. We followed the high-speed ferry in, passed Brandt Point lighthouse, and easily grabbed our mooring line. If you read the blog from Monday, August 20 you know that we were successful in getting our dogs to use the sod on the aft deck for their potty. Well, almost two weeks later, things have gone downhill. I have no idea why. Macey decided it was better put to use as a bed. Oh brother!! Every household has different ways of operating. And every“boat-hold” has different ways of operating. Some women arehandy with tools and engines. Some men love cooking. That,however, is not the case in either our house or boat-hold.Just as John doesn’t “do” provisioning and cooking, I don’t“do” engines. I offer no apologies for either of us. It’s just theway it is, and we’re both happy with that! That said, organizing the boat for a 2 plus month excursioninvolving season changes and the potential for unexpectedguests, is a huge job. But after 10 years of doing it, I’velearned to be ready for any and every thing; and fortunatelyI’m pretty organized. (On the other hand, I could take lessonsfrom my daughter-in-law, Sara. She is a master at it!) Butbecause we take a different boat north each year, it’s almostlike starting over every time. My list consists of not onlyclothes and food, but hundreds of items for the galley, heads,staterooms, our portable office, personal items, books, andeverything else it takes to be self-sufficient and away fromhome for an extended period of time. And, because this isnot simply a pleasure trip, we also have to bring everything ittakes to run our business plus all our boat show supplies andequipment. Yikes. For the sake of this blog, there are three things you shouldknow about me: 1) I am list maker, 2) I am a seeker of sales,and 3) I am not a “foodie” (My foodie friends actually feelsorry for me when I tell them I basically eat to survive.) Soabout two months prior to scheduled departure I take mylist, seek out items on sale, tick them off, one by one, makepiles and fill boxes. And I cook. I fill our freezer with chili,stew, pot-roast, meatloaf. That way I don’t have to rely onrestaurants being in the area where we stay for the night, nordo I have to do a lot of cooking on board. I can just defrost it! Many of our cruising friends set their itinerary based onwhat restaurant they want to visit next. We prefer to pick ourmarina or anchorage first, and then if there’s a restaurantnearby, fine. If not, I’m all set! As we approached Norfolk, Virginia, the seagrasses, undeveloped acreage, and serenity of northern North Carolina gave way to sirens, horns, generators, train whistles, tug boats, and the hussle bussle of a busy port. Norfolk is home to the largest Navy base in the world along with one of NATO’s two Strategic Command headquarters. It also has the corporate headquarters of Norfolk Southern Railroad. The region plays a vital role in defense contracting, with particular emphasis in the shipbuilding and ship repair businesses. Many of the largest international shipping companies also are headquartered in Norfolk. “Security” boats (above) guard the numerous aircraft carriers and other Naval ships docked for repair, including the USS Harry S. Truman, which we saw in port. Working our way past Norfolk, we entered Chesapeake Bay which, thankfully, welcomed us with calm waters. As this is a huge body of water (200 miles long, 30 miles wide), with the right elements, the Bay can be very rough. John finds it an interesting challenge to examine our day’s cruise and, depending on where we are, look at those variables which impact our progress. These could be tidal currents or bridges and locks with restricted openings. Based on these variables, we determine the time we start our day (usually at 7 am, but occasionally at 8), and consequently can determine the approximate arrival time at our destination (usually 4-5 pm). Also, with regard to bridge openings, we make appropriate speed adjustments. This is a major reason that we really appreciate having the ability on the Krogen Express to vary our speed (running from 8 kts up to twice that, if we want to). In order to most efficiently plan the day you have to have good information……currents and their strength and direction, locations of bridges and how often they open (some are “on demand”, some are on the half hour, others on the hour), We are able to find all this information on an app we use on our IPAD from Garmin. It incorporates information from the data base of a cruisers guide called Active Captain. (www.activecaptain.com) It provides info about bridges/schedules, marine facilities, fuel prices. Block Island behind us, and our first boat show of the season looming, we cruised into Newport awaiting directions from the dock master at the Newport Yachting Center. Once settled into our slip, we greeted our fellow boat company associates-turned-friends as they pulled in. We sort of equate the boat shows to being in the circus! We unpack our wares, work the show, pack up again, head to the next location, and do it all again! The next day, Monday, the fun began! We had to turn our live aboard vessel into a boat show masterpiece. John began with polishing all the outside stainless steel (a big job), I scrubbed the dinghy, and then we washed every square inch of the outside. Tuesday a friend came down from Boston to visit and (lucky me!) I got the afternoon off! Newport is a very fun place to visit….lots of marine history, beautiful mansions, cute shops, and excellent restaurants. One note about our favorite restaurant Rhode Island Quahog Company, a place we love to visit every year for their excellent clam chowder (definitely the best I’ve ever had)…apparently out of business! We were devestated. But despite the demise of the Rhode Island Quahog Company, definitely put Newport on your “go to” list if you haven’t been there already. Wednesday it was back to work…thoroughly cleaning the inside of the boat, and setting everything up. We were eagerly anticipating the kick-off of the fall boat show season, so we were charged up and the work was fun and invigorating. Thursday through Sunday we worked the show under sunny, blue skies. We have, in past years, experienced nor’easters where the rain was falling sideways, so we were particularly appreciative of the lovely fall weather. The attendance was bigger than we’d ever seen, altho that’s not necessarily indicative of boat buyers. But everybody was in a good mood and having a grand time. Best of all, one of our owners who resides in Newport, pointed us in the direction of a restaurant called “@ the Deck” where on Monday nights you can get a gigantic lobster roll + fries for only $6.95. It was such a great deal that even John walked out saying “I almost feel like I didn’t pay enough” !!! And if you know John, you’ll really appreciate that comment! Monday we had planned to make the trek down Long Island Sound to our next gig in Norwalk, CT. But the winds and the waves were just too big, so most of us decided to hang out and make the trip on Tuesday. It was a good chance to relax and enjoy the town (AND allowed us to get that lobster roll. Sometimes being delayed isn’t so bad!) Tuesday brought calmer winds and waves, and we headed out. Safely docked at Norwalk Cove Marina, the washing began once again, only this time in a more abbreviated fashion. I took time off on Wednesday to have lunch with some childhood girl friends who still live in the area, which was very fun. Thursday we were ready when the show opened at 10. Our dogs, M.E. and Macey, went to doggie day care (the only boat show that provides this service) and had a blast! We worked hard during the days and had fun at night reconnecting with more old friends. Flexibility is key when boating; and that is definitely the case for those of us with schedules. With the thought that we had to drive along the coast of New Jersey to get to our next destination (Annapolis), we closely monitored the sea conditions while we were still in Norwalk. The plan was to run along the Jersey coast on Tuesday following the show. Our daughter, Joy, was coming out from the city to meet up with us in Norwalk. We were going to head out on Monday morning and cruise down the East River in Manhattan ( a trip she hadn’t previously made), cruise around the Statue of Liberty and New York Harbor, through the Verrazano Narrows bridge and then over to Atlantic Highlands, New Jersey. Joy would catch the fast ferry back to New York. Once through the Verrazano Narrows bridge and into lower New York harbor (which has direct exposure to the Atlantic Ocean), the seas became very choppy and we were “taking it on the beam” (to non-boaters: “on the side” which makes the ride less comfortable). It was a long 45 minute ride to the anchorage at Atlantic Highlands, but we made it, dropped the hook (anchor), and headed to bed at 12:30 a.m. This is generally a very protected anchorage, but the wind continued to pick up and it was from the least protected direction. Needless to say, it was a bumpy night. In the course of listening to the winds building and howeling through the night, we decided that it was better to stay put and delay the Jersey coast trip. Monday we put the boat in a slip at the marina, and spent the day with Joy in our cozy salon. We put Joy on the 4:00 ferry, and settled into a quiet evening. As forecast, Tuesday morning brought more wind and heavy rain. Ugh. No Jersey coast today! More sitting around, some boat chores and, once the rain stopped, a trek to the grocery store and post office. Wednesday morning we awoke to fair skies and light winds, and while the wave height forecast was more than we would have liked, we decided to go for it. (We were spurred on by the prediction of a tropical storm coming up the eastern seaboard from Florida which would have further delayed our trip.) Once around Sandy Hook and into the ocean we discovered that the seas were not so bad. The swells were quite large, but they were reasonably gentle. This allowed us to enjoy a comfortable ride at displacement speed (9-1/2 knots), burning 5 gallons/hour. Our intention then was to stop at the town docks of Chesapeake City, Maryland, a town along the C&D Canal which connects the Delaware and Chesapeake Bay. When we arrived and found the docks full, we decided – once again – to keep going. Afterall, our final destination, Annapolis, was only another 50 miles. We could arrive there by dawn! I decided to take another nap, intending to relieve John when I awoke. But when I opened my eyes, all I could see were big barges on either side of us (by this time we were on the upper Chesapeake Bay). I went back to sleep and let him handle the helm!! That’s what any smart first mate would do! Fifty miles later, at 7:30 a.m. Thursday morning, we were safely docked in our friends’ slip near the Rhode River. By this time the anticipated storm was upon us. The rains poured, the winds howled (what else is new?!). But we had covered 232 miles in 24 hours. We were fast asleep. It was nice to be in Block Island when there weren’t so many tourists, although there were enough for us! We pulled into Great Salt Pond (the large mooring field/anchorage) on Friday around 1, and with the help of our binoculars spotted our friend’s mooring ball. The wind was blowing like crazy which made it a more difficult procedure than usual. In fact, remember that couple I mentioned in a previous blog entry? We were the animated ones this time! Oh well, it happens. The wind also made going ashore a wet and salty experience because there were white caps in the mooring field! And over the weekend, the wind let up only occasionally. We took some nice long walks which felt very good after being exercise restricted the past two weeks. Block Island is very quaint with historic lighthouses, rolling hills, sandy bluffs and winding roads. It is located 13 miles south of the coast of Rhode Island and 14 miles east of Montauk Point on Long Island. The island became a part of the colony of Rhode Island in 1672, and it’s 1000+ inhabitants live on a land area of about 10 square miles. There are no name brand stores on the island. Everything is independently owned, even the grocery. We enjoyed 2 full days there, heading out on Sunday morning for Newport. When we got out onto Block Island Sound we found the water rougher and the wind stronger than we had expected. We were driving into a east-northeast wind. Thank goodness we had the option to pick up the speed and get there twice as fast! Advancing north into Narragansett Bay the seas calmed down and we were able to enjoy the sites…..two huge cruise ships anchored in Newport Harbor, gorgeous estates, including Hammersmith Farm, the childhood home of Jackie Kennedy, and stately 2 masted sailing yachts, heeling and sails billowing. Even though it was a cool, damp day I could tell the sailors aboard were really enjoying themselves. Personally, I like being dry, warm, and cozy in my pilothouse! We got situated in our slip at the show and began to see our fellow boat show compadres! We equate the boat show circuit to the circus in that we all go to the appointed locale, set up, display our wares, take it all down, and move on to the next spot! We have lots of work ahead of us the next several days. After Newport we head west to Norwalk, Connecticut for the next show beginning Thursday, September 23. Stay tuned for future blog entries.